In 1962, a committed group of Santa Barbara citizens came together to form an organization aimed at helping motivated students attend college or vocational school. 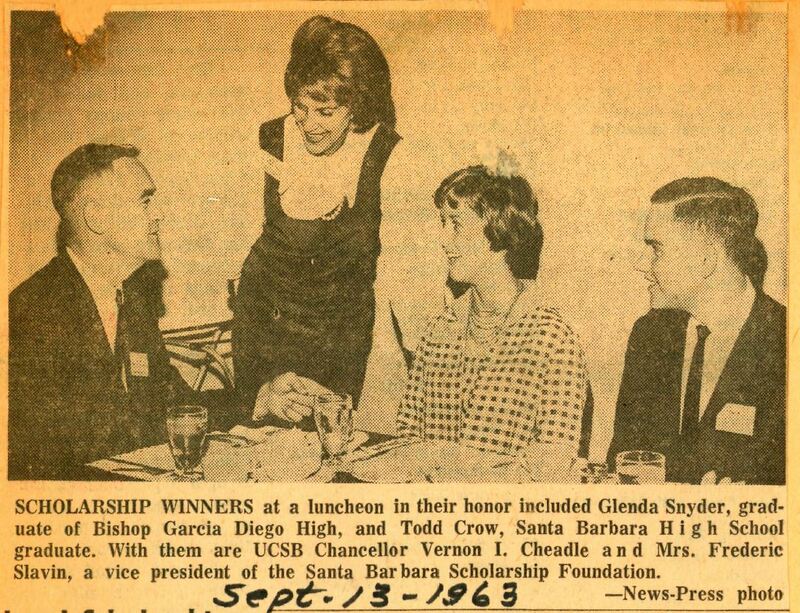 At its first meeting, on May 29, 1962, the group gave the organization a temporary name, the Santa Barbara Scholarship Clearing House. Most in attendance were officers of the Parent Teacher Association, who knew from personal experience that more scholarship help was needed in the Santa Barbara community. To make their case, they invited counselors from San Marcos and Santa Barbara high schools to relate stories of students who wanted to attend college but lacked scholarship aid. Participants unanimously voted to establish a permanent scholarship organization that would support both college and vocational study. Over the next several weeks, the group surveyed local high school students and learned that demand for scholarships greatly exceeded supply. The group also accepted its first donation: $25. Most importantly, it decided on a name – the organization’s Articles of Incorporation were filed with the state of California using the name Santa Barbara Scholarship Foundation. Just six months after its first meeting, the Foundation had 35 Board members and held its first fundraising event, a New Year’s Eve party at the home of Annette Slavin that raised almost $350 for scholarships. Slavin, the Foundation’s vice president in charge of publicity, convinced the mayor of Santa Barbara to proclaim Scholarship Week in March, among other promotional efforts. A small, temporary office was set up in the back room of Slavin’s travel agency on State Street. At the end of summer 1963, the Foundation made its first awards: nine $100 book awards to students. The following year, the Board of Directors declared February Scholarship Month, and later announced its first annual scholarship, for a student studying law. By its second year, the Foundation Board had 65 members, and held a gala fundraiser, which included a screening of “The Barber of Seville” at the Riviera Theater, followed by champagne and hors d’oeuvres. In 1965, the Foundation received its first significant gift: $10,000 from the Elizabeth Firth Wade Endowment Fund. Key early Board members included Ruth Nadel, who served as the organization’s first president; Slavin, who would succeed Nadel as president in 1965; attorney James Black, who wrote the Foundation’s first bylaws; and developer Michael Towbes. In response to the Foundation’s success and growth, the Board unanimously voted to appoint Carolyn Ferguson executive secretary on part-time basis in 1965. A year later – two years after the Foundation’s tiny office had moved to Ferguson’s garage – she was named executive director. In 1968, the Board made a decision that many now say helps explain the Foundation’s enduring success: All Board members would be required to interview students. Training sessions were held to prepare interviewers, a practice that continues to this day. By the end of the decade, the Foundation had given away 1,000 scholarships. Today, the Foundation is the nation’s largest community-based provider of college scholarships, having cumulatively awarded in excess of $108 million to more than 50,000 county students since its founding in 1962. The organization began providing free financial aid counseling in 1975, and was renamed the Scholarship Foundation of Santa Barbara in 1993.